Pick up the phone and call (201) 327-5258 today for a high quality driveway contractor in Bergen County NJ. We will send someone out to look at your driveway, then provide you with a free estimate for our services. Click here if you’d like to see our current online coupons and discounts. At McFarlane Asphalt, we’re experts in parking lot and driveway paving in Bergen County NJ. Asphalt is a flexible and versatile paving material that’s made from aggregates (crushed rock, sand or gravel), bitumen and filler. The result is a substance that is easy to use for a variety of different surfaces, including driveways, parking lots, sidewalks and walkways. Asphalt doesn’t last forever though, and over time, it becomes faded and breaks down. That is why aligning yourself with a high quality, local paving contractor is a great idea if you have a residential or commercial asphalt surface to manage. Want to find out what other people think of our services? Click here for online reviews. Don’t underestimate the importance of quality when it comes to commercial paving in Bergen County NJ Whether it is the right thing to do or not, people will associate the state of the parking lot with the quality of the store, restaurant or office building they came to visit. Even if the two aren’t related at all, they will just remember that their car fell into a huge pothole while they were visiting Joe’s Bakery, and the two will always be connected. Keeping your parking lot in good shape with distinct lines and minimal damage will create a perception of high quality in the public’s mind that includes the business itself. 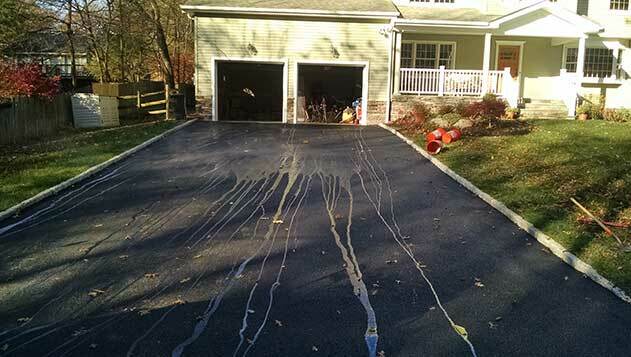 Need a New Driveway In Bergen County NJ? If you’re looking for a new driveway in Bergen County NJ, you need a contractor you can trust. If your current driveway has seen its best days and it is time for something new, we have several options that will work for you. You can have a brand new asphalt driveway to replace the one you have, or you may prefer something unique, like a paver driveway. Sometimes, a complete replacement isn’t even necessary and you’ll be able to boost the look and function of your driveway with an overlay or sealcoating treatment. After an inspection, we will work with your budget to determine the best course of action to get your driveway back to its original beauty, or provide you with the new driveway you’ve always wanted. If you’re like most homeowners, business owners and property managers, you know the exterior of your home or commercial building can create a perception about you. This perception extends to the surface of your driveway, sidewalks and parking lots. Call McFarlane Asphalt at (201) 327-5258 for expert service that will always create the perception you want.